Triang Windows are made of a metal square window frame with tabs to hold it into position on the house, they come in three colours brown, green and blue depending on the age of the house. Pre war houses normally have brown and cream windows, Post war green and white. The two opening window frames slot into two little tabs. They also had thin strips of material in the windows to represent curtains. 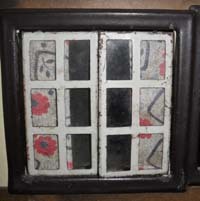 Older windows have strips of lace. You can see the curtains in this picture, they had become very fragile with age. It is uncommon to find windows with curtains, also the metal frames become rusty as they are stored in damp places. 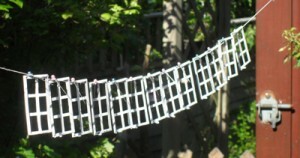 A number of my houses have suffered from damp, warping the wood and rusting the metal. The curtains in these windows were in very good condition, so I was able to save them. They did need a little repair around the edges to stop them fraying. 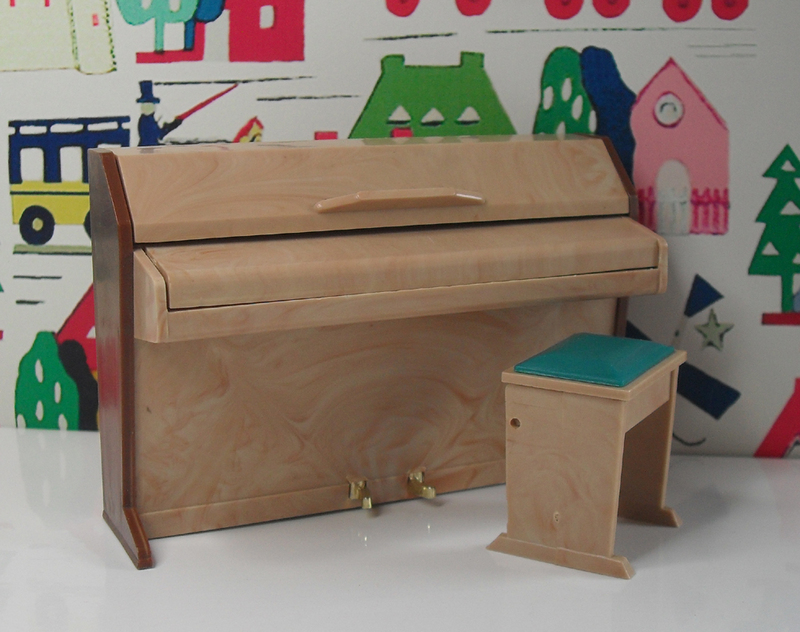 Remove the windows from the dollshouse, by gently lifting the tabs on the edge of the frame. Remove the window inserts from the frame, by carefully bending up the little tab on the insert which fits it to the frame, using a pair of pliers. Do this just enough to all the little tab on the window frame to be released. Only one tab on each insert needs to be bent. If you window inserts have curtains, gently remove them, I use an old kitchen knife with a broken end to ease up the lip of the insert. Take care not to damage the material. I have found the best way to do this is by removing the plastic first, giving more room for the curtains to slip out without too much force. They are not glued in, just held in place with the lip on the insert. Next ease up the lip so that there is room to get into to remove any rust or dirt. On the inside of the window insert, using a dremel drill with a small rough grinding bit on it start to clean up the insert, removing any old paint, dirt and rust. Turn the window insert over, using a cotton wool bud dip into paint stripper and remove the paint, wipe off using kitchen roll. Remove and rust or dirt as described above. 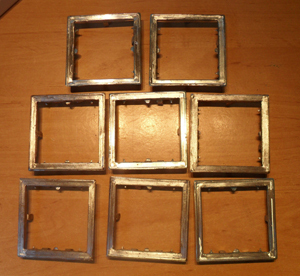 These pictures show the windows with the paint removed, they have been treated for rust and are ready for painting. 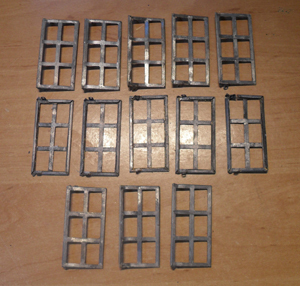 I have found the best way to paint the window frames is to hang them outside on a piece of string and spray them, it is easy to get an even amount of paint on each one without getting messy. They dry well outside on a sunny day. Cut a piece of clear plastic to fit the window. Fit the clear plastic into the groves around the edge of the window. Place the piece of curtain wrong side up, against the opening edge of the grove on the window, carefully ease it into the grove. Take care not to damage the curtain. [not shown] Using a hammer and a piece of wood gently tap the grove closed, use the piece of wood to protect the metal and give it a more even finish. 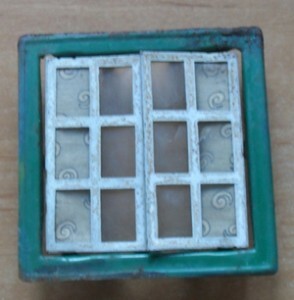 Gently bend the little tabs on the window up a little so they can be fitted onto the tabs on the brown window frame. When in place bend tabs back over the pins so they are at right angles to the frame, again be very gently and take your time. Repeat the instructions for the other half of the window.